One of the highlights of the exhibition is A Woman Artist (Le Corset rouge), (c.1661-4) which was recently found in a private collection and features Metsu's wife, Isabella de Wolff, who frequently modeled for her husband. (Image courtesy of the National Gallery of Art, Washington, click to enlarge). One of the most remarkable painters of the Dutch seventeenth century, Gabriel Metsu (1629-1667) is the subject of the autumn exhibition at the National Gallery of Ireland. Gabriel Metsu: Rediscovered Master of the Dutch Golden Age’ brings together some 40 works from one of the most important genre painters of his age. A contemporary of Vermeer, Metsu painted scenes of everyday life as well as portraits, biblical scenes and still lifes. The show displays a number of recently discovered and newly restored paintings. It features works on loan from the Louvre, Paris; The Metropolitan Museum of Art, New York; National Gallery of Art, Washington; The Prado, Madrid; The National Gallery, London; Pinacoteca Capitolina, Rome, several museums in Germany (Dresden, Kassel, Berlin, Munich) and The Netherlands (Rijksmuseum, Amsterdam; Stedelijk Museum De Lakenhal, Leiden; Mauritshuis, The Hague). Dr. Adriaan Waiboer, curator of the exhibition and editor of the accompanying catalogue says: “This exhibition is an opportunity to discover a lesser-known, but highly talented artist, whose work offers a unique window onto daily life in his time. Metsu was gifted with an unparalleled handling of the brush”. 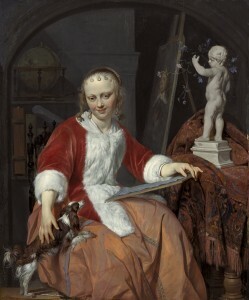 Metsu is at the National Gallery from September 4 to December 5, at the Rijksmuseum, Amsterdam December 16, 2010 – 21 March 21, 2011 and the National Gallery of Art, Washington April 17, 2011 – July 24, 2011. Along with having worldwide record sales of over 55 million singer-songwriter Roger Whittaker is an inveterate collector. The long time Co. Galway resident has hit songs that include easy listening standards like Durham Town, New World in the Morning, Mamy Blue, I don’t believe in If anymore and The Last Farewell. Now 75, he plans to re-locate with his family to the South of France. Sheppards of Durrow will hold an auction of his collection over two days on September 28 and 29 next. The 650 lots from the Roger Whittaker Collection make up an eclectic mix that includes fine antique furniture like a Regency two pillar dining table and a set of antique dining chairs, sculpture, wildlife photographs, 14 Taylor guitars, a stunning collection of watches from houses like Patek Philippe and Cartier, a very rare death mask of the Irish poet Patrick Kavannagh and collectible items gathered by Whittaker on his journeys around the globe. The Sheppards catalogue for this sale is due to go on-line on September 15.
register grate, in the manner of George Binns of Dublin. The auction will bring to the market some 200 rare, important and unusual pieces, ranging in date from the 1600s to the 19th century, and emanating from all corners of Europe. 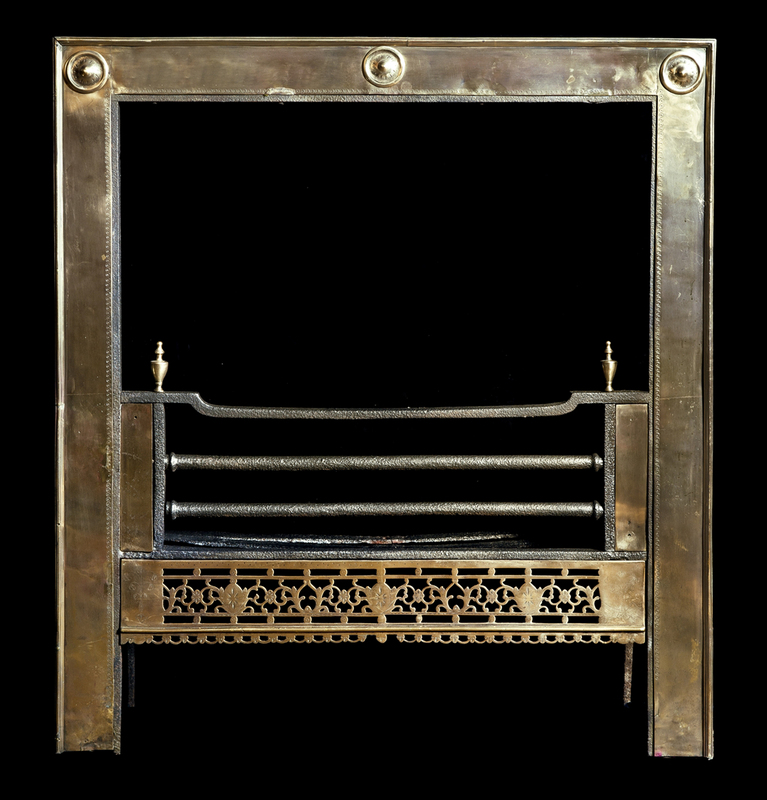 Tbe chimneypieces to be sold represent almost the entire antique stock of leading London fireplace suppliers Chesney’s, which also maintains offices in New York. 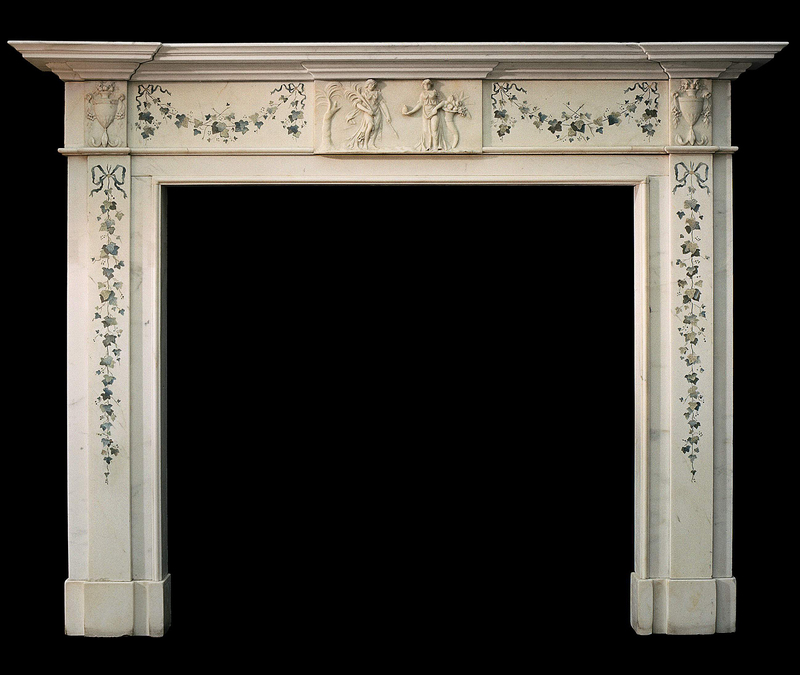 The company has released its antique stock because the focus now is on its increasingly international operation of producing and supplying fine reproduction fireplaces. 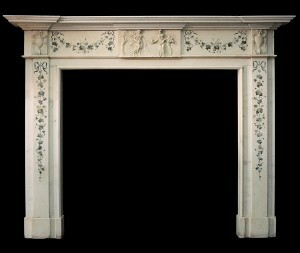 The sale will offer an overview of chimneypiece design over the course of 300 years. 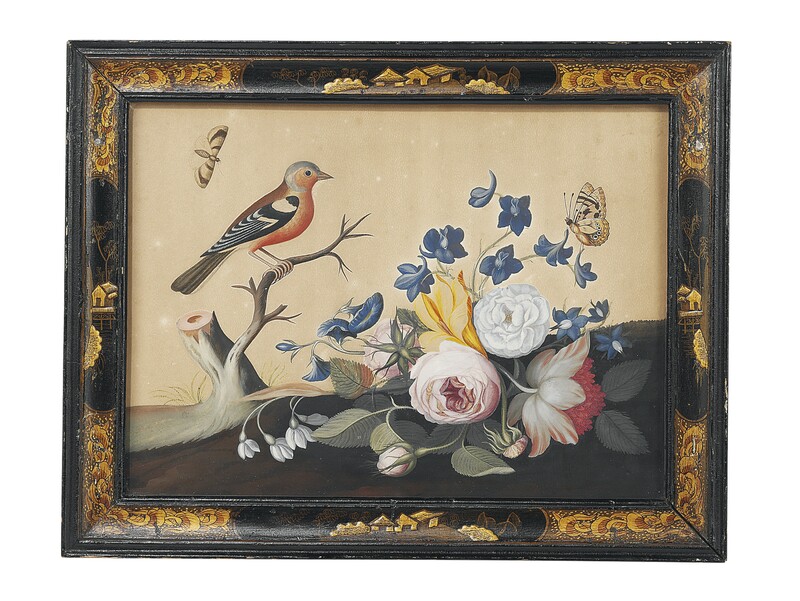 Not much is known about Pietro Bossi, although much inlay work of the late 18th century is commonly known as “Bossi-work”. He used coloured marble inlay and also a coloured paste inlay, known as scagliola, on a white marble ground. Bossi’s process was a closely guarded secret and was apparently carried out behind closed doors. He left Dublin in 1798 under a cloud of suspicion implicating him with the revolutionary movement. UPDATE: The illustrated pieces made 85,250 and 1,875 pounds sterling respectively. An Irish George III scagliola inlaid Carrara marble chimneypiece in the manner of Bossi also made 82,250. The sale total came to 674,378 GBP. 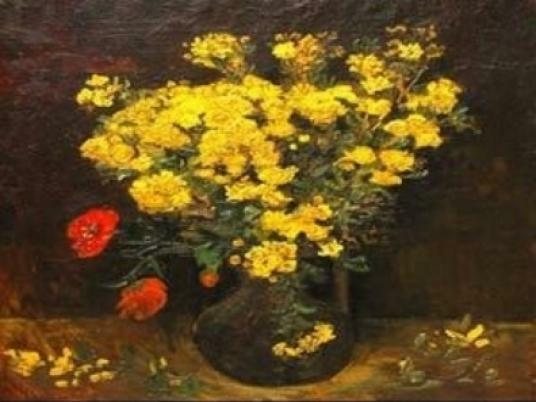 A Van Gogh painting worth $50m, known as both Poppy Flowers and Vase And Flowers, was cut from its frame and stolen at the Mahmoud Khalil Museum in Cairo on Saturday, August 21. Measuring 30cm by 30cm(1ft by 1ft), and depicting yellow and red flowers it is believed to have been painted in 1887, three years before the death of Vincent Van Gogh. The Mahmoud Khalil Museum was built in the 1930’s and holds works by Monet, Renoir and Degas. The same Van Gogh was stolen from here in 1978, and recovered ten years later in Kuwait. In May five paintings — worth up to $124 million — were stolen from the Musée d’Art moderne de la ville de Paris (see post for May 20 on antiquesandartireland.com). INTERPOL, the world’s largest international police organization with 188 member countries, has a database of missing art. The organization’s general secretariat also produces a CD-ROM – updated every two months in English, Spanish, French and Arabic – of all the missing items, and provides it to museums, antique dealers and collectors. The London based Art Loss Register (ALR) is a growing computerized international database about lost and stolen art, antiques and collectables. In July 2010 a stolen Caravaggio was recovered in Berlin. The ‘Taking of Christ’ or the ‘Kiss of Judas’ was snatched from the Ukraine’s Museum of Western European and Oriental Art in Odessa in July 2008. A joint German Ukrainian police operation resulted in three Ukrainians and one Russian national being detained in Berlin, just as the suspects were reportedly about to sell the stolen painting. More than 20 suspects were arrested and an alleged international art theft gang was broken up. 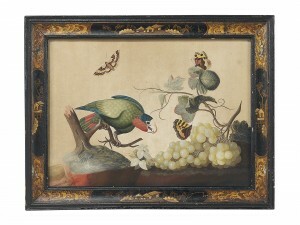 Another of Samuel Dixon's bird pictures. (click on image to enlarge). 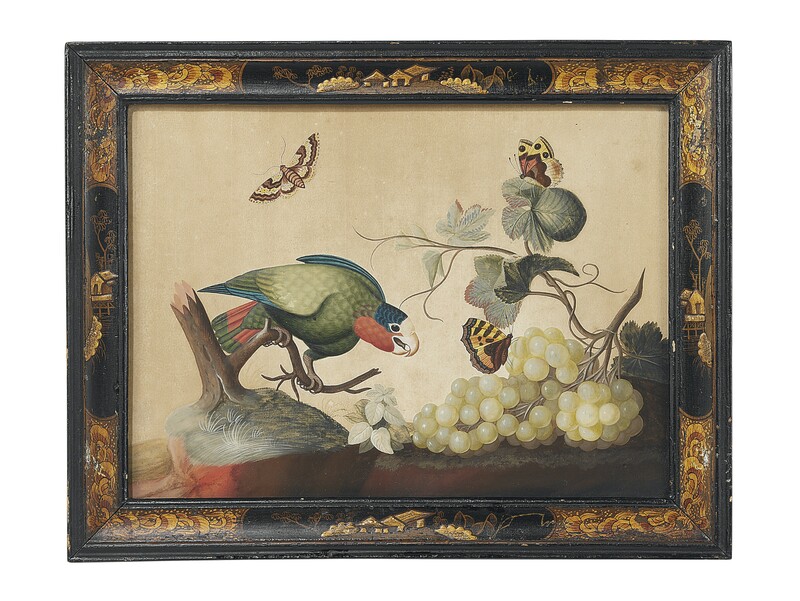 A set of 12 Irish George II embossed bird pictures by Samuel Dixon c1755 is a highlight at Christie’s 500 Years of Decorative Arts Europe sale in London on September 23. In black and gilt-japanned frames each is printed with a dedication on the reverse. The estimate for the lot if 10,000-15,000 sterling. They are among a election of 50 British and Irish embossed bird pictures from a 150 piece private collection by Samuel Dixon, Isaac Spackman and William Hayes in a sale of over 300 lots. 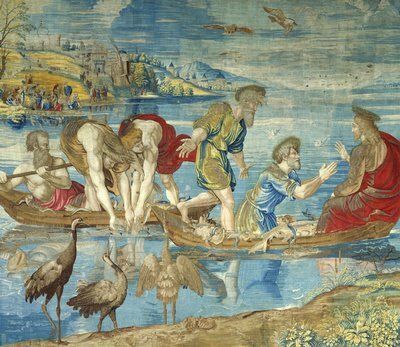 An exhibition of four of the ten tapestries designed by Raphael for the Sistine Chapel goes on display at the Victoria and Albert Museum in London from September 8 to October 17. The exhibition of these original tapestries, masterpieces of High Renaissance art, will coincide with the historic visit to England and Scotland of Pope Benedict XVI. They have never been seen in England before. The tapestries, of the Acts of St Peter and St Paul, The Miraculous Draught of Fishes, Christ’s Charge to Peter, The Healing of the Lame Man, and The Sacrifice at Lystra, were made for the Sistine Chapel almost 500 years ago after Raphael was commissioned by Pope Leo X in 1515, three years after Michaelangelo completed the chapel ceiling. The tapestries were woven in Brussels, Europe’s leading centre for tapestry-weaving. Interest in tapestry has been on the increase since the spectacular Tapestry in the Renaissance show at the Metropolitan Museum, New York, in 2002 which highlighted the great cycles of the late 15th and early 16th centuries as the unsung glories of Renaissance art. The Vatican Museums own the tapestries, the Cartoons, or designs for them belong to Queen Elizabeth. They have been on long-term loan to the V&A since Queen Victoria lent them in 1865. The four tapestries will be hung in the V&A’s Raphael Gallery next to the seven Cartoons. The design of each cartoon corresponds in every point, but in reverse, to the tapestry it was made for. The weavers cut Raphael’s cartoons into strips and copied them closely, weaving each tapestry from the back. The front image was therefore the reverse of its cartoon. The painted strips of cartoon were joined together again later, and became prized as artworks in their own right. THE contemporary art evening sale at Castletownshend on August 11 realised 145,000. The money raised from work donated by artists will help fund the Jim O’Driscoll Gallery at the new west Cork Arts Centre in Skibbereen. (see post for August 4). The range of prices was mixed, with something for everyone. Large numbers turned out for a summer evening sale which was held out of doors. The top prices paid were 10,000 for a Basil Blackshaw, 8,000 for a painting by William Crozier, 5,400 for a work by Brian Bourke and 5,000 for a painting by Donald Teskey. 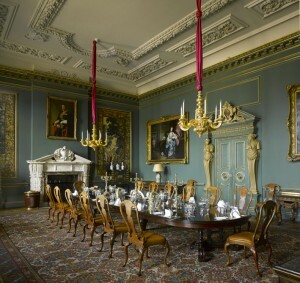 Historic Houses Association (HHA) and Sotheby’s Restoration Award 2010 is Wilton House near Salisbury in Wiltshire. Wilton’s winning project is its spectacular private Dining Room, which is the centerpiece of an extensive programme of exceptional restoration projects at the house in recent years. The house stands on a 9th century nunnery founded by King Alfred. The Benedictine abbey and surrounding lands was surrendered at the time of the Dissolution of the monasteries to King Henry VIII, who gave them to William Herbert around 1542. Wilton House has remained in the Herbert family since this time and is the home of the Earl of Pembroke. William Herbert, the 18th Earl of Pembroke, inherited the title and the Wilton estate in 2005. With the assistance of the Wilton House Trustees and interior designer David Mlinaric he initiated an extensive programme of restoration projects aimed at parts of the house that it was felt had lost their historical integrity or which had been neglected during previous structural repairs. Both traditional and modern methods of restoration have been used and, wherever possible, the work has been undertaken by estate and local craftsmen. 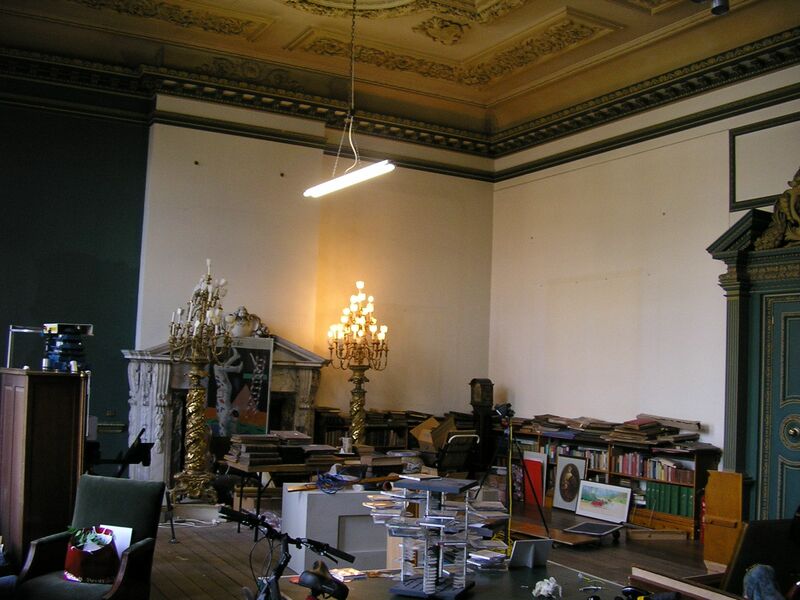 For many years the Dining Room was used as a games room and general storage room but in 2008 the 18th Earl commenced the major restoration efforts to return it to its former glory. The walls were painted in a dark blueish green to match an existing paint sample and the ceiling and paneling mouldings in a stone colour, which were subsequently part-gilded by Hare & Humphreys. Two new caryatids were created from those in the Library by Coade Ltd, to stand either side of the doorway. 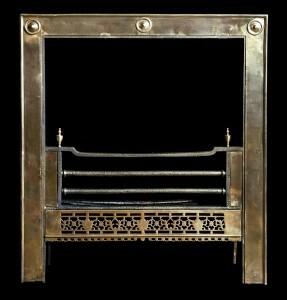 Antiqued-looking glass panels were set between the windows on the north wall, and new metal radiator covers were made. 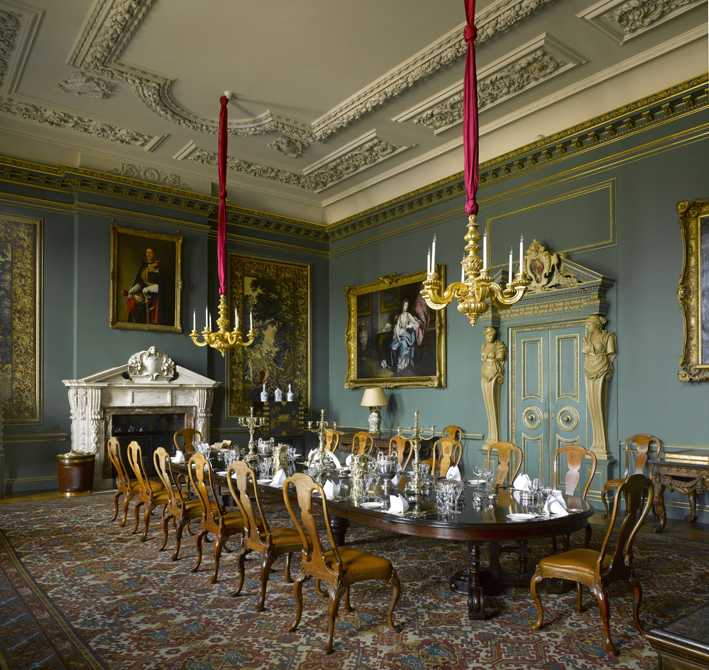 The furnishings underwent major conservation work – two giltwood torcheres, three tapestries, the table, two large Reynolds portraits. Two new chandeliers were also made by Coade Ltd and subsequently gilded by Lord Pemboke’s sister. SOTHEBY’S has reported improved revenues for 2010. For the three and six months ended June 30, 2010, auction and related revenues improved $118.8 million, or 79%, and $168.4 million, or 86%, when compared to the same periods in 2009. This is almost entirely due to an increase in auction commission revenues stemming from strong sales around the world during the period. Total aggregate auction sales were $1.6 billion in the second quarter and $2.2 billion in the first half, an increase of 110% and 116%, respectively. Combined sales of Impressionist and Contemporary Art increased $428 million, or 154%, and $684 million, or 188%, in the second quarter and first half of the year, respectively. “These are excellent results and are indicative of the improving art market we have been experiencing since last autumn,” said Bill Ruprecht, President and Chief Executive of Sotheby’s. “They reflect strong revenues coupled with discipline on the expense side and we will continue to focus on both going forward. CHRISTIE’S announced worldwide sales of £1.71 billion for the first six months of 2010, up 46% on last year’s figure of £1.2 billion for the same period. Figures include the buyer’s premium. Edward Dolman, ceo at Christie’s said: “Global confidence in the art market has been evident throughout the first half of 2010 and we expect it to continue with our autumn sales. The power of great art sourced from notable collections has driven sales”. “In 2009, the challenge of supply contrasted with buyer demand leading to consistent, high sold rates. In 2010 this has led to increased vendor confidence and at the higher end of the marketplace we have seen a number of key sales setting new price levels”. The results reflect the growing importance of Asia, where a significant return on investment is seen. The investment in technology has led to increased involvement from global clients.